Pirate's Alley | Experience New Orleans! Pirate Alley (or Pirate's Alley, as many call it) is the subject of much legend and lore, some true, and much false. 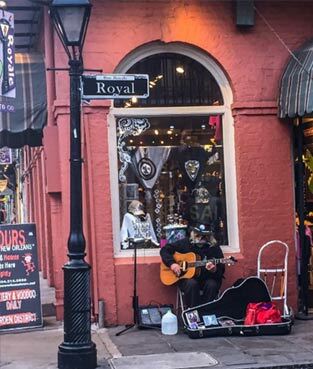 It is one of the "must see" locations of the French Quarter. Some claim that it was a haven for pirates in days past, while others claimed that slaves were sold at the adjacent St. Anthony's Garden on Royal Street. It is probable that there is little or no truth to either. But, it does make good stories. In reality, its official name was Orleans Alley, until the mid 1960's when the city changed it to Pirate Alley. This was to reflect its name of common usage, and to make it easier for tourists to find. 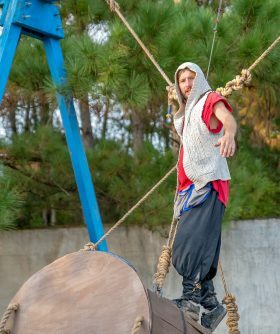 Why it was called Pirate Alley is left to conjecture, but there are some facts to consider. 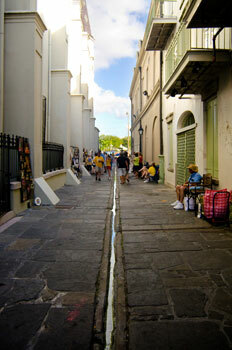 Looking down the alley, you will notice that the St. Louis Cathedral is on one side. On the other is the Cabildo (the Old Spanish Governor's Mansion), and directly behind the Cabildo was the Spanish Dungeon. Some find it hard to believe that pirates would hang out between a dungeon and a church. More likely, the term reflected an expression of the times. Just as we hear today, expressions like "being brought to the lock-up" or being "stuffed into a paddy wagon", it most likely was an expression that suggested being thrown into the dungeon. It may have been something like "they will take you down Pirate Alley." Who knows? The alley is one block long, and extends from Chartres St. at Jackson Square to Royal St. Halfway down the alley, a lamppost marks its intersection by Cabildo Alley, which extends (the width of the Cabildo) to St. Peter St. This is likely one of the most famous lampposts of the French Quarter, as long and as often as Pirate Alley has been photographed and painted. Located in Pirate Alley, but closer to Royal St., is the Faulkner House, named for William Faulkner who wrote his first novel while residing there. Right across the alley is the iron fence of St. Anthony's Gardens (part of the St. Louis Cathedral). It is on this fence that the participants of the annual New Orleans Spring Fiesta Pirate Alley Art Show display their work each spring. If you visit Pirate Alley often, you will find it to be, at times, as warm as a springtime morning courtyard, or as foreboding as a cold, dark, fog shrouded London Street. Morning, noon, evening and night, for the four seasons, its appearance and character is ever changing. Always have your camera so that you can take photographs.